Unless we, the people this legislation will effect, take action now politics will win!! This is a post I read on a compost tea forum I belong to. Use the link provided to let the USDA know how you feel. "Under pressure from industrial agriculture lobbyists, the USDA has quietly approved a new regulation that will effectively end distribution of raw almonds, while putting many smaller almond farmers out of business. The regulation is scheduled to go into effect on September 1st, unless thousands of consumers take action now. The rule requires pasteurization of almonds, including organic, yet allows those same almonds to continue to be labeled as "raw". Nutritionists point out that raw, organic almonds are far superior, in terms of nutrition, to pasteurized almonds. One of the FDA-recommended pasteurization methods involves the use of propylene oxide, which is classified as a carcinogen in California and is banned in Canada, Mexico, and the European Union. Organic and family-scale almond farmers are protesting the proposed rule, saying it will effectively put them out of business, since the minimum price for the pasteurization equipment is $500,000." Don't let the industrial ag lobbiests win this fight. Fight back with your input. Take a stand!! Apologies for being gone so long. Time flies and I had no idea I had been away and without a post since April? Life has been busy here with the start of Market and active worming season. Summer has been hot, high 90's, but the bins have remained in the 60's so the worms have been happy. 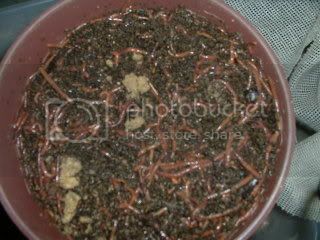 With time being of short supply, I have had to be creative in order to not have to re-harvest my worms over and over every week if all of the worms did not sell at market. This is what I have come up with for holding bins for the active season. 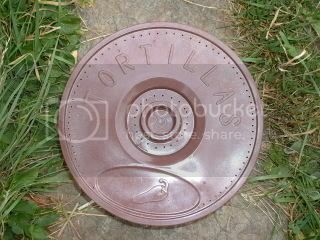 Before I had my Tortilla Redworm Holding Bin I would spend valuable time harvesting worms, packaging them in my brown paper bags and then if they didn't sell I would have to just dump them back into the worm bin. Now I can harvest worms, take them to market in the holding bin, package them if they sell, or hold them in the bin for the next week if they don't sell. In the holding bins I can continue to feed the worms, keeping them happy and in fact fattening them up until the next opportunity to sell them. As I continue to work the big bins, turning and harvesting worms I rotate the oldest harvested holding bins back into the big bins.